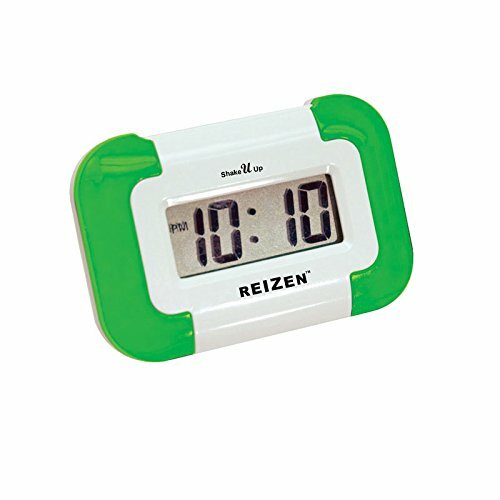 Wake up to the reliable, discreet vibration of the Reizen Shake-U-Up Vibrating Compact Travel Alarm Clock. This compact vibrating alarm clock features a pulsing vibration alarm that is helpful for the deaf and hard of hearing, and is also convenient for those who want to wake up without disturbing their partner. The Reizen Shake-U-Up Vibrating Compact Travel Alarm Clock also offers an option of an audible beep alarm. This compact size vibration alarm tucks easily under your pillow and is ideal for travel. It's even small enough to carry in your pocket as an appointment and medication reminder. The built-in fold-out stand allows for use on a nightstand and doubles as a protective cover for the buttons, preventing accidental button presses. Uses one AAA battery (not included.) 6-Month Manufacturer's Limited Warranty. Color: White with blue accents. Color: White with green trim. If you have any questions about this product by Distributed by Life with Ease, contact us by completing and submitting the form below. If you are looking for a specif part number, please include it with your message.